A volatile past. An uncertain future. This collection of recipes are both Traditional and Modern. Basque cuisine predates both Spanish and French, as many recipes in those countries have Basque origins. A cultural uniqueness from neighboring countries even in today's world, is the cuisine. In fact, many cooking traits and recipes from Spain and France have origins from centuries before in the Basque country. The traditional ways of cooking have been brought into today's Basque homes, and remain that of the most unlike any other forms of modern cooking. 1. In a large, heavy nonreactive skillet, combine the olive oil and garlic slices and cook over moderate heat, stirring occasionally with a wooden spoon, until the garlic is lightly golden, about 1 minute. Add the shrimp and dried red chiles and cook, stirring frequently, just until the shrimp are opaque throughout, 3 to 4 minutes. Immediately remove the skillet from the heat and season the shrimp lightly with salt. 2. Serve the warm shrimp at once in their flavored oil with the bread for sopping it up. In large 4-6qt Soup pot, add in water, chicken, salt and pepper. With dental floss or cooking twine, tie together peel, cinnamon and basil. Add to pot. Allow mixture to medium boil for approximately 25 min. Squeeze out and remove chicken, then remove tied spice. Reduce heat to simmer, and add in remaining ingredients. Allow to cook on low for another 2 hours. An unusually exquisite seasonal side dish that serves double-duty as a conversation piece. This crispy treat makes a unique addition to average hoers-d'erves or side dishes. Cut pumpkin into 3"x 3" squares (leaving peel on). Arrange in large baking dishes (covered). Bake 300 degree oven for 45 minutes or till fork inserts easily. Arrange slices on greased cookie sheet, side by side. Slice onions into paper thin rings, placing one layer of concentric ring slices on top of each pumpkin. Top each with 1 tbsp. brown sugar, pepper, salt, and 1 tsp. olive oil. Place in broiler, browning tops till onion gets light-medium brown. *Can also be served as a dessert, by substituting onion with a splash of pumpkin liqueor. Rich marinade good for seafood or meats, and is often used to marinate lamb. Combine all ingredients. Allow to soak into meat for 4 hours to overnite. Can be stored in freezer until ready for use. 4 lb of lamb shoulder cut into pieces. Brown lamb in oil or lard with onion, garlic, carrot, and pepper. When vegetables are soft and meat is getting tinges of brown add salt to taste, parsley, wine and broth to cover. Cook for an hour or until meat is getting tender. Add potatoes which have been previously browned in oil. Cook until done. - The basque people firmly believe that they were the inventors of this delicacy. Truly it is highly regarded as a standard in any traditional home, as it is made in abundance on Sunday, so it can last throughout the week. In large 8 qt. stockpot, pour in oil to med-hi heat. Add in leeks and sausage. Stir to brown lightly. Add in potatoes, seasonings, and flour. Toss together till flour is incorporated. Reduce heat to low. Add in chicken stock. Stir till all ingredients are well combined. Cover, place bay leaves in pot, allowing to simmer for 1 hour. Stir in parsley just before serving. Place in individual serving bowls, and top each with French bread chunks. Flour and salt/pepper the oxtails. In large sautee pan,medium brown both sides in oil on med-hi. Put in another pot and cover with 1/2 of the chicken stock. In the first pan,add onions and garlic to the frying oil, and fry until golden. Add the remaining flour/salt/pepper and stir. When it acquires a dark color, add wine and the remaining stock. Whisk well, till smooth. Add the sauce to the oxtails. Add green peppers and carrots. Cook everything on med-low for about 2 hours. In large med-hi preheated skillet, add oil, seafood, and seasonings. Stir occasionally till light brown. Remove and leave juices. In same pan, add sofrito ingredients. Sautee till light brown. Remove and leave juices. Add oil and rice only, stirring till rice becomes slightly browned. Add chicken stock, continue to stir and cook for 10 more minutes. Turn off heat source. Add saffron. Add in soffrito mixture. Stir once. 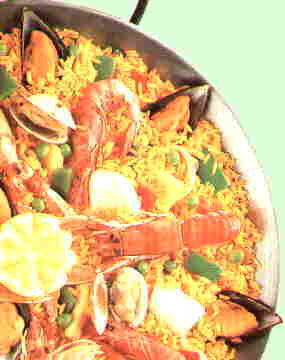 Place rice mixture in bottom of 12-14 inch Paella dish (use an 8 Qt. ceramic casserole if you do not have one). Spread evenly. Place seafood mixture evenly atop the rice. Bake in oven for 40-50 minutes. Do not stir once in oven. Remove from oven, and cover for 10 minutes (allowing to steam). Fan avocado slices (lengthwise) around perimeter of pan. Serve in pan at table with frsh lemon slices on each person's plate. In med. saucepan, bring water to simmering boil. Add mushroom caps. Cook each side for 4 minutes. Drain water. Dry with towel, and place on cookie sheet face up. Set aside. In same pan, combine remaining ingredients, sauteing till loightly browned. Fill caps tightly to top with mixture. Place in oven for 10-15 minutes, or till golden brown on tops. - Serve with lemon wedges. Piquillo peppers--slightly sweet and spicy--are a delicacy grown predominantly in the Basque province of Alava and in Navarre. The peppers are handpicked and roasted in brick ovens before being peeled and preserved in brine. In the United States, these bottled peppers are available at specialty food stores. You can substitute fresh pimientos or small red bell peppers. Dried salt cod is a staple of Basque cooking. Before it is cooked, it must be soaked to eliminate excess salt and to rehydrate. In this recipe, allow 36 hours for soaking. 1. In a large bowl, soak the salt cod in plenty of fresh water in the refrigerator for 36 hours; change the water at least 5 times. Drain. Cut the cod crosswise into 1/4 -inch strips. 2. In a medium saucepan, warm 3 tablespoons of the olive oil over moderate heat. Add the salt cod and cook, stirring gently, to heat through, about 3 minutes. Stir in 1 tablespoon of the flour until incorporated. Gradually mix in the milk. Reduce the heat to low and simmer, stirring often, until the mixture has thickened, about 25 minutes. Cool to room temperature. 3. Keeping the roasted peppers intact, remove any seeds and carefully stuff each pepper with a heaping tablespoon of the cod mixture. 4. In a large nonreactive skillet (stainless steel or glass), warm the remaining 1 1/2 tablespoons olive oil over moderately low heat. Add the onion, carrot, parsley sprig and garlic and cook, stirring occasionally, until the onion is soft, about 12 minutes. Blend in the remaining 1/2 tablespoon flour and then stir in 1 cup of water. Bring to a boil, cover and cook for 10 minutes to blend the flavors. Uncover, stir in the sherry and simmer for 3 minutes. Transfer the mixture to a food processor and puree until completely smooth. Pour the sauce back into the skillet. Season with kosher salt. 5. Carefully place the stuffed peppers in the sauce. Cover and simmer gently over low heat until the peppers are heated through, about 3 minutes. Transfer the peppers to serving plates and spoon the sauce around them. Sprinkle the chopped parsley on top and serve at once. In 4 individual 8" crock or glass pie dishes, melt (1 Tbsp each pan) butter, coating sides and bottom. Evenly sprinkle 1/2 tsp cinnamon and 1 Tbsp brown sugar on bottom of each pan. Lay apple wedges in circular pattern on bottom of pans not touching. Set aside. In mixing bowl, fold together unbeaten eggs, water, milk, salt, and baking powder just till combined and still lumpy. Be very careful not to overmix, as overmixing will cause flat cakes. Evenly divide batter into each dish, coating bottom and apples of each completely. Bake for 35-40 minutes or until browned on top. Squeeze 1 wedge lightly over top of each, placing used wedge on side of pastry as garnish. Place 1 tsp Raspberry on center of each pastry. Serve in dish (hot) immediately. 1 lb. Med. size peeled prawns. Melt butter (margarine is not as flavorful in this) in large skillet on Med-High. Brown prawns in butter lightly for 1 minute on each side. Add in all mushrooms and cover for 5 minutes. Allow the mixture to glaze, and DON'T stir. Uncover, and add all remaining ingredients. Lower heat to simmer and cover. Allow to cook 10 more minutes, stirring lightly, and scrape bottom to release glaze. Serve immediately. *In small glass or plastic mixing bowl, combine all ingredients and set aside (for later use). *In large mixing bowl, use pastry blender to blend both ingredients until well combined. *In medium mixing bowl, combine eggs and 2 tbsp of the alcohol mixture, then add into butter/sugar mixture. Dough should be very sticky. Move tightly covered bowl, and refrigerate overnight. *Sift last 6 ingredients together well with whisk. This ensures even distribution of the baking soda and cornstarch. Directions: Mix egg/egg yolk and sift cornstarch and sugar together into the egg mixture. In a medium-size pot bring the milk to a boil. Add a few tablespoons of hot milk to the egg mixture and mix. Add the egg mixture to the pot of milk. Mix and cook over low heat until thick. Stir in the remaining alcohol mix and vanilla. Strain through strainer or cheesecloth into medium bowl. Cover with plastic wrap and put in the refrigerator til chiled. Mix together egg, milk and salt. Preheat oven to 375f. Grease or butter a 9" spring-form pan. Divide dough in half, one part 2/3 and the other 1/3. Put the large half in the pan and cover bottom and sides with the dough. Pour in the filling into the center of dough. Shape the remaining dough into a circle the size of the pan and lay it on top of the filling. Join the corners of the top dough with side dough and pinch together with wet fingers to seal. Brush the edge of the dough with water. Poke about 6 - 8 air holes in the top of dough with toothpick. Bake 20 - 35 min. or until golden. Serve warm. together eggs and milk; pour over potato mixture. out onto serving plate, or serve from skillet. Sprinkle crumbled bacon atop. Serve hot. In baking dish, baste a butterflied leg of lamb, and allow to marinade for at least 2 hours (up to 24 hours). Place lamb on a Roasting rack with a drippings catcher under it. Pour the water into the reservoir. Place in oven for 65-75 minutes. Baste occasionally. Remove from oven and cover tightly for 20 minutes to seal in the juices. Pour remaining marinade into a small saucepan. Simmer and stir until sauce reduces to thicken. Pour in a gravy boat,and use as a gravy to pour over the lamb. oil as necessary. Sprinkle with salt and pepper. paprika, thyme and hot pepper flakes. 1. Soak the beans overnight in a bowl of cold water. (Alternatively, in a large saucepan, cover the beans generously with cold water and bring to a boil; simmer for 2 minutes, remove from the heat, cover and let sit for 1 hour.) Drain and rinse the beans; transfer them to a medium flameproof casserole. Add 1 quart of water, the onion and green pepper and bring to a boil. Reduce the heat to low and simmer for 45 minutes. Add the clam juice, cover partially and simmer, stirring occasionally, until the beans are tender, about 40 minutes. 2. Add the clams. Cover the pan tightly and cook over moderate heat; remove any opened clams after 5 minutes and check every 2 minutes thereafter. There should be enough liquid to keep the beans moist; add a few tablespoons of water if needed.